On Saturday morning at 10 A.M., at a rally called by herself, Charlotte Golar-Richie endorsed Marty Walsh for Mayor. Walsh’s face wore a stun, as if he too couldn’t quite believe he now had the support of the Primary ballot’s three leading candidates of color. Frankly, I was stunned too. But not for long. Hardy had Golar-Richie finished speaking when the news broke that basically her entire campaign staff — finance chairman, field director, and the staffs of several of her local headquarters — were all joining the John Connolly campaign. 1.Why did Golar-Richie not endorse at the same time that Barros and Arroyo did ? Reportedly they asked her to join with them. But she did not. Why ? 2.Why did she wait three full days thereafter — during which time the CUPAC and Black Ministerial Alliance, both of which groups had backed her in the Primary, publicly endorsed Connolly — before finally doing what Barros and Arroyo had asked her to do on Tuesday ? 3.Why did she not endorse John Connolly, since almost all of her staff did so ? 1.Golar-Richie did not want the impact of her endorsement to be diluted as part of a group. She would endorse alone and draw all the attention. 2.She was always a careful candidate whose campaign hallmark was caution and flexibility to all sides –in keeping with her persona as a manager impartial. Thus the waiting period, during which she “carefully assessed” Connolly and Walsh. “Careful assessment’ would lend gravitas to her decision when it came. 3.Meanwhile, she was known to have been one of Menino’s choices to succeed him, and she had been part of his administration; and Menino had already and obviously chosen to give help to Connolly. The period of “careful assessment” allowed her staffers quietly to make their arrangements to join the Connolly camp and thus put a smile on Menino’s chin. 4.Now having assured her staffers of a safe haven — and herself of having gifted Connolly the meat of her campaign — she was free at last to take care of a significant task of personal politics : ( a ) an endorsement of Connolly by her would allow Arroyo and Barros to box her out, among voters of color (if she chooses to run for elected office again) as not being for “working families”; of favoring the “banker’s candidate” — the ‘school privatizer” — as folks in various camps close to Barros, Arroyo, and Walsh were aleady saying; and ( b ) an endorsement of Walsh would prevent that. Thus Walsh it had to be. A gamble, but a well planned one. I am guessing that the feverish phone calls back and forth that the Herald’s Peter Gelzinis said took place from Thursday into Friday were about that very issue. Charlotte’s Menino friends told her to get with Connolly : and so she pondered, and gave her staff (and the PAC’s) time to do exactly that. 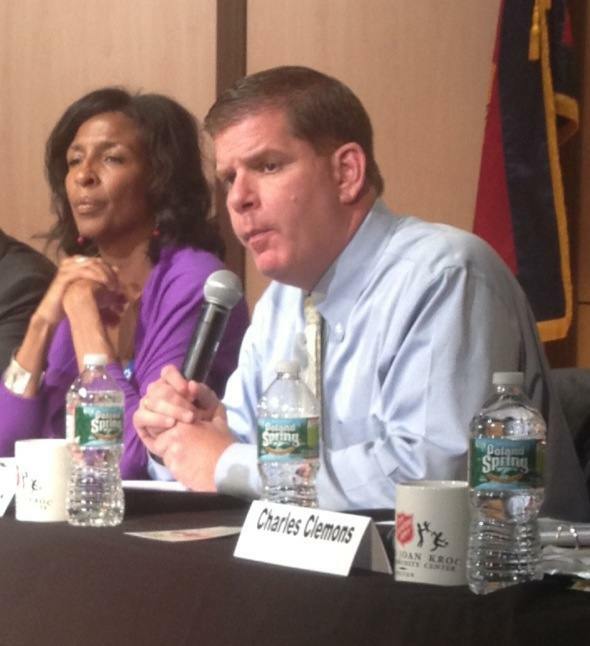 Meanwhile, Charlotte’s Walsh-supporting friends told her to endorse Walsh or be boxed out. And so, once the backstage work was safely done, she endorsed Walsh. Simple. Shrewd. The reward of caution. Many smart politicians play both sides of a divide. It’s one of the most successful ways to occupy the political center. Occupying the center — what former Boston Mayor candidate John Sears calls “Playing center field” — was Golar-Richie’s campaign theme, its tone, its distinction, its claim to seriousness. She owns it, and as long as she can “play center field” without errors, she’ll be a serious force in political baseball no matter which man becomes Mayor.